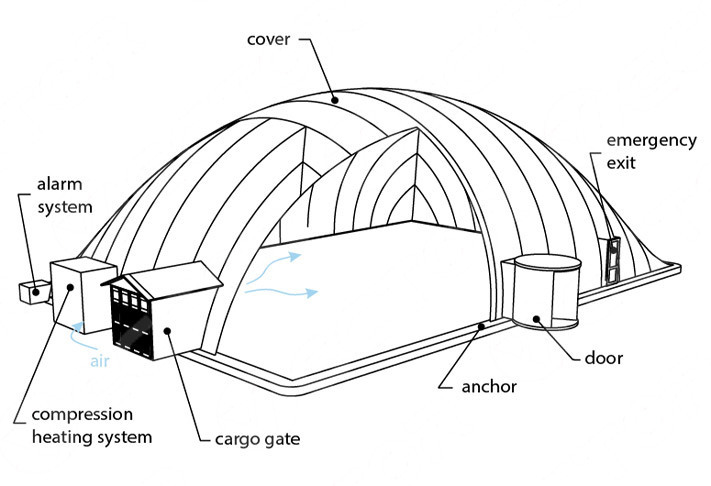 An air-supported structure is an envelope of reinforced fabric, tightly attached to the base. Into the envelope the air is supplied, creating a positive pressure and being a support for the structure. Thus, the construction is resistant to wind and snow loads. The construction may be a monolayer or bilayer. The use of two layers of PVC fabric provides better resistance to heat transfer, which saves up to 30% on heating costs of the structure. In a two-layer air-supported structure the distance between the envelopes is about 0.5 m.
An air-supported structure is a leak-proof construction, which is sensitive to air leaks. As the front group there is used a gateway system. For the passage of trucks there is used a cargo gateway. The variety of range of high quality PVC fabric allows to built the translucent air-supported buildings. However, on customer's request, the construction can be designed with the use of glazed stained glass systems. The pressure equipment developed by our company, is designed to be the most cost-effective and to provide fast air supply to the entire building. In the basic building construction it is provided with the main fan and emergency pressure system, which is triggered in case of failure of the main fan or power failure. The air supply system is equipped with an automatic control ventilation systems, which fact eliminates errors from the category of the “human factor”. All the equipment is located in noise-dampening enclosure made of galvanized sheet, outside the building. An air-supported structure can be installed on any prepared site. The foundation for this building serves only as an anchor, which does not allow it to rise into the air. Its depth can be 30-50 cm. In order to reduce the costs of preparatory work, the foundation can be made as a belt with the width up to 0.5 m. There is also the possibility to avoid the foundation construction completely. For this purpose, the perimeter of the building is stacked with the cylinders with water or sand. They keep the building and prevent air leaks. This is especially useful when it is necessary to put the building only for a short period of time. For example, for an exhibition. In the daytime, enough light enters in the construction because of the use of translucent materials. For lighting in the evening, the structures is equipped with the lights of 400 Wt. As the equipment for a micro-climate creation there are used generators, heat guns, ventilation and air-conditioning system of the world manufacturers. Our company has experience in creating a special micro-climate favorable for plant growth.